President Trump is vowing a government shutdown if Congress doesn’t fund the wall for the southern border. Oh, I hope he does just that if they don’t approve the funds. Just shut it down. He said this last night in Phoenix during his speech to massive applause. I think I speak for an awful lot of Americans when I say, just freaking do it. I’m sick of these budget battles where all these politicians do is spend more and more money we don’t have, fight over pork for their own little piece of America and then extort us all into following their wretched mandates. Congress has until September 30th to fund the wall, or go dark. I think Trump would relish a shutdown. I know I would. The Democrats have sworn to not support funding for the wall — see Elizabeth Warren — and have blocked Trump at every turn as he has tried to get it through. So, now he’s playing hardball and the Republicans are squirming. Fun. If a budget passes without the funding in it, no doubt Trump will veto it and a government shutdown will ensue. Pass the popcorn and make me a samich. 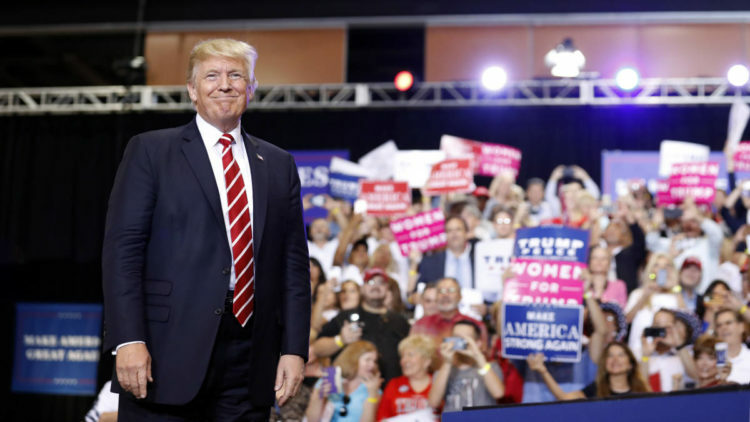 During his rally in Arizona on Tuesday, President Donald Trump slammed Congress for not going ahead with plans to build the wall across our southern border and even pledged to shut Washington down if it doesn’t get done. “If we have to close down our government, we’re building that wall,” Trump told rally-goers in Phoenix. The president was talking about the coming budget battle, according to CNBC. If Congress does not reach a funding deal that the president signs into law by a Sept. 30 deadline, the government will shut down. Congressional Democrats have explicitly said they will not support a deal that includes money for the wall. … The White House has sought federal funding for the wall, which is spending Democrats have pledged not to back in a bill. The majority Republicans will need the minority party’s votes to keep the government open. Trump’s biggest campaign promise was the building of the wall. So, he’s going to hold Congress’ feet to the fire. They want to put him in a tough spot… he’s going to squeeze them between a rock and a hard place. He still wins if they overturn his veto as Americans will turn on Congress en masse and a lot of politicians will lose their cushy jobs. Will you bite the hand that feeds you? Bring it. “Believe me, if we have to close down our government, we’re building that wall,” Trump said at a campaign rally in Phoenix, where the crowd responded: “Build that wall. Build that wall. Build that wall.” That’s music to my ears and has got to send a cold bit of sweat down the backs of DC politicians. Notice I didn’t say ‘spines’. It’s the one thing they seem to fear the most. Fund the damn wall and let’s get this done. The idea that Trump would play hardball with Congress to get money for the wall to stem the flow of illegal immigrants and fulfill a major campaign promise has been an undercurrent in Washington for months. Now, it’s time for Congress on both sides of the aisle to either betray Americans one final time and reap the rewards of such a betrayal, or finally support the President. Should be an epic fight.